And we’re back. I am wide awake at 5am somehow, most likely because I konked out at 10pm last night after a very busy day at various Dutch Design Week exhibits. I am eating chocolate truffles for breakfast. Sheesh, hopefully my eating and sleeping habits will regain a bit of normalcy tonight. Although I have only really had the tip of the iceberg, everything that I have eaten here has been quite delicious! If you are sensing a tinge of previous doubt in that sentence you are not mistaken. I did indeed have a few doubts about Dutch cuisine since a few acquaintances had warned me of little to no variety and the high probability that I would even get sick. Well in the case of my visit I found that neither of those to be a problem! So far my favourite traditional Dutch food item has been a tie between the infamous Hollandse Nieuwe pickled Herring and the Dutch-style Pannenkoek (Pancake). Let’s talk about Dutch pannenkoek. This decadent (almost-thin-as-a-crepe) pancake can be topped with everything from apples to chicken to ham and pineapple. The batter is unique in that it seems to have a very flexible, sturdy build while still maintaining a fluffy, delicate bite. It can hold up to a LOT of toppings and cheese, and it is a notably generous portion. Oh, and there’s this dark molasses-like syrup found on the table at any pannekoek place for you to drizzle on – preferably by writing your name, in cursive, on the pannekoek. ( Just one of the many hilarious things to make you fall more in love with Dutch culture. ) I had the vegetarian pannekoek at De Smickel in Soest– and was in heaven until I reached the halfway mark and I wasn’t sure how I would ever stand up again. The first night in Amsterdam I enjoyed a wonderful meal at Van Kerkwijk, a very gezellig spot in the heart of the city. Minimally decorated yet still very warm and inviting, this sort of joint reminds me that less is more if you know what you’re doing. Every table has an old fashioned brass candlestick, and there are bunches of thoughtfully arranged flowers scattered throughout the dining room. The restaurant is run by two sisters who were as warm and welcoming as the surroundings they created. The menu was a fixed priced 3 course dinner which changed every night (my favourite kind). We started with a smoked mackerel mousse on dark wheat toasts, and for my main course I had a perfectly seasoned, perfectly cooked duck breast with fig jam and butter-braised wild mushrooms. A usual suspect, duck breast has been known to be a gamble- but this chef definitely knows this and isn’t messing around. My handsome host enjoyed the seared ribeye, cooked to perfection as well served over a bed of macerated strawberries and creamy chèvre- a surprisingly delicious combination. We passed on dessert and finished our carafe of wine before happily strolling home through the city. I came down with a pretty awful cold on the second night, and was unable to pull it together enough to go outside so we decided to have a nice dinner in instead. This is the night I met and fell in love with Rijsttafel. This Indonesian dinner spread is something out of any culinarians dream. The ability to try a little of everything is my favourite way to eat, and I know I’m not alone here. 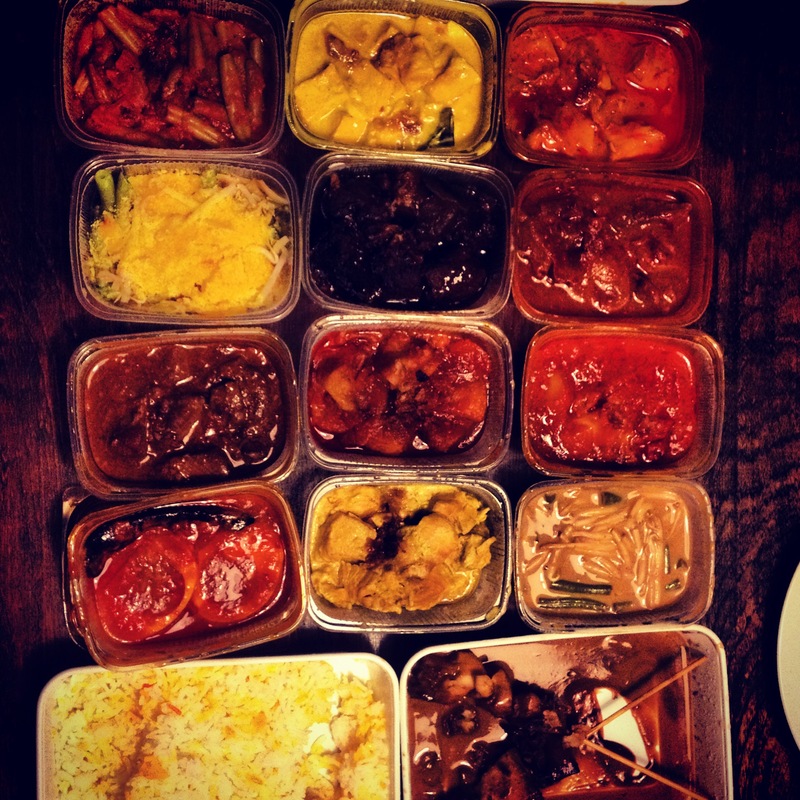 The individual plates are all Indonesian curries and stews, but the arrangement of the rijsttafel (Dutch for “rice plate) is actually a Dutch concept. For 30€, you can order what is called a rijsttafel for 2 people. What you get, is enough food for two people…for 4 days. We ate the 12 selections over the course of one dinner, two lunches, and even one breakfast. Brilliant, now how do we convince someone to do this in the US? Oh my! It is time to pack for Italy tomorrow! 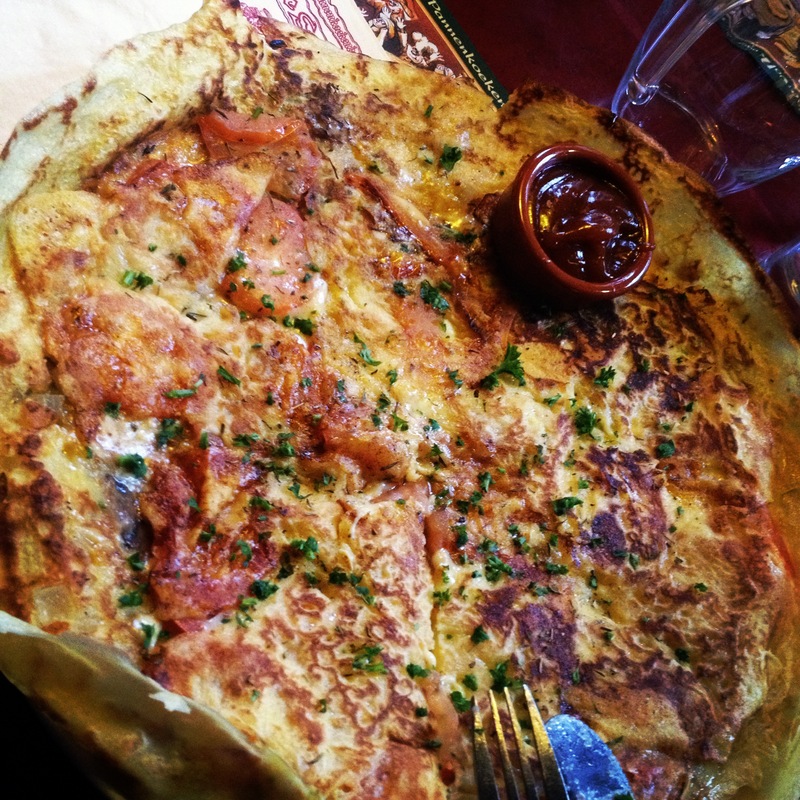 This entry was posted in Journal and tagged amsterdam, herring, holland, pannekoek, rijsttafel. Bookmark the permalink. 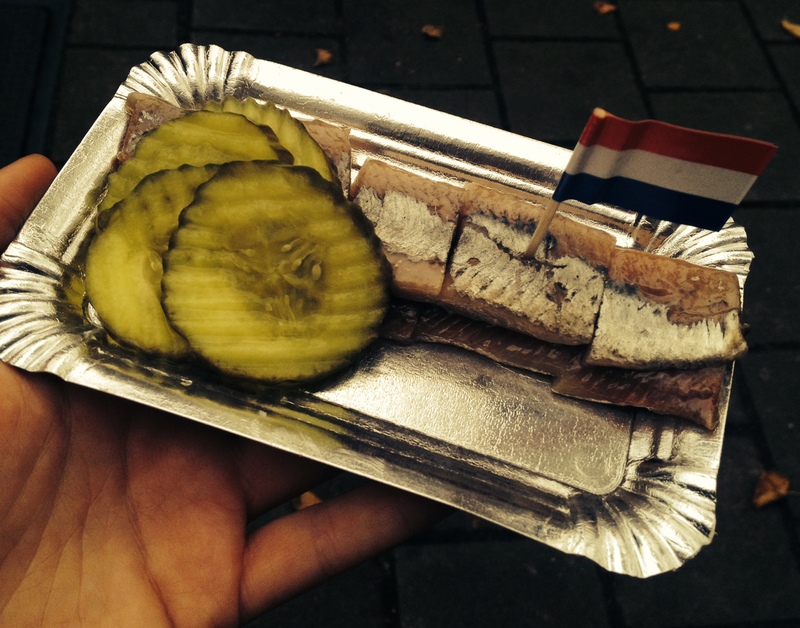 Herring, or as we call it ‘zoute haring’ is one of my favourites also. Those little parts as a snack or the whole fish, grabbed by its tail sliding down :-). I’t also very nice on a roll of white bread. Yummy.